*What Type of Tape Do You Want? If you are a hair dresser, own a salon or simply want the best double sided tapes available then AiryHair’s German made rolls (or pieces) is exactly what you have been looking for. Forget cheap tapes that just end up falling apart after a few washes, we use a super strong yet gentle on hair adhesive that ensures extremely long-lasting look. The best part? These tapes can be removed just like the regular ones, either by applying few drops of the tape remover liquid (recommended) or as a last resort, acetone free nail polish (last resort homemade solution).If you have been disappointed by other tapes before, then give us a go, we guarantee your satisfaction. Looking to buy other items in bulk? Check our volume orders page as well as special discounts for hair salons and hair dressers. 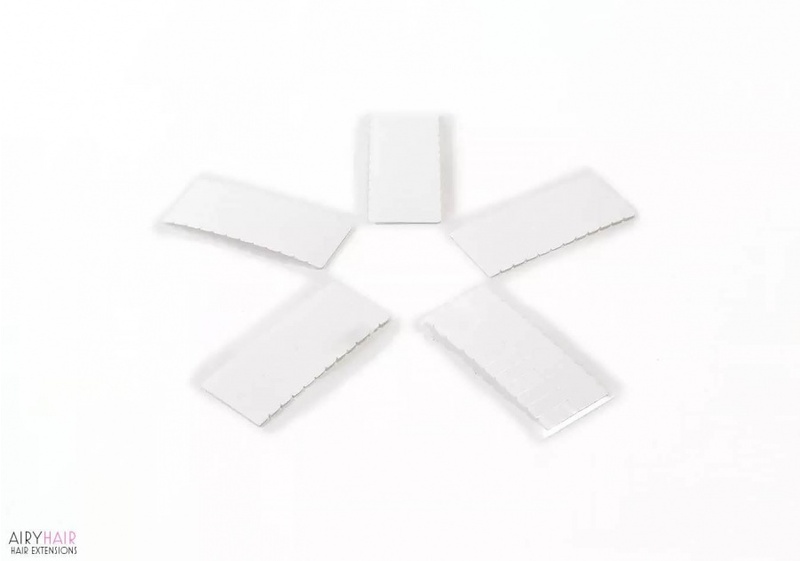 The adhesive tape is very thin and for that reason it is very comfortable and you can barely feel it on your head. This ensures a natural look and prevents the tape from showing. The tapes are transparent which also ensures you they won’t be visible because they blend in nicely with the hair. They will not get damaged whatsoever during washing or other maintenance. The tape is also very easy to remove and will not damage the hair. Tape Pieces Versus a Tape Roll: What's the Difference? Both tapes contain a high quality adhesive that is super strong and will hold even after multiple washes. 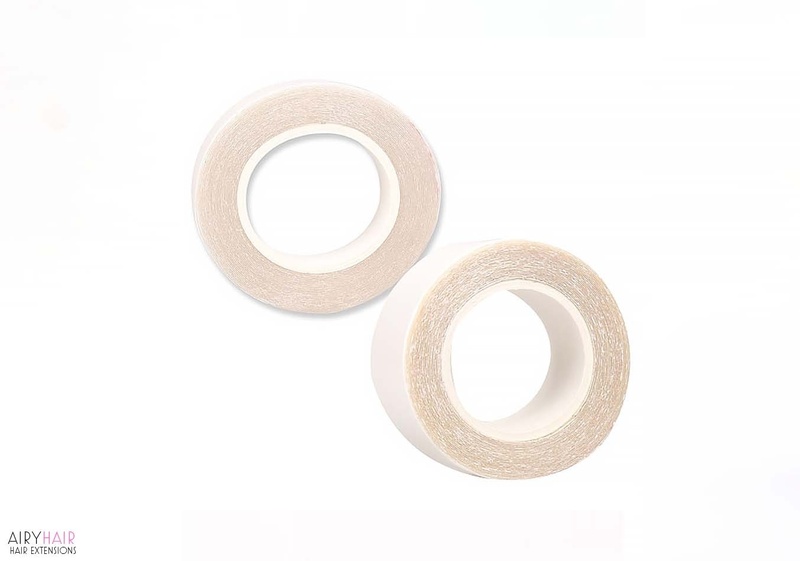 There are two types of adhesive tape you can buy, depending on what your particular needs are. • Tape Pieces: The first option is individual pieces of tape (a pack of 24), 4 cm x 0.8 cm in length or 1.57" x 0.31" in inches. These are already cut and ready to be installed which makes the whole process a lot quicker and easier. This is a great option if you want to try to apply tape in extensions yourself, without going to the salon because the tapes are instantly ready for use. • Tape Rolls: The second option is buying a big tape roll which is 3 yards long (2.7m x 1 cm). This is perfect for salons and businesses that use a lot of tape and need a big quantity. The tape needs to be cut since it comes in a roll, but it is a much cheaper option. So if you go through a lot of tape regularly in your salon, this is a great option. You will also receive a special discount if you order large quantities! AiryHair double sided tapes are used for tape in hair extensions. They enable you to safely and seamlessly tape the extensions onto the hair and add length and fullness. The adhesive tape has to be very strong to stick properly to the hair and of high quality to prevent the extensions from falling out. That is why it’s important to choose the right tape and avoid using cheap Chinese ones. AiryHair adhesive tape is made in Germany and is one of the best ones you can buy. Tape in hair extensions are very easy to install and if applied properly can last for a long time, depending on the speed of hair growth. After they grow out, they should be reinstalled. Usually, one tape in is placed under a strand of hair and another one is placed on top of it. That process is repeated in different places on the hair, ensuring proper blending. If the extensions are applied correctly, no tape will be visible and it will look just like natural hair. Please pick from one of the several available shipping methods. • Free shipping: if you pick this shipping method, you will receive the tapes within 10-20 days. Your item will be sent by registered air mail. • Expedited shipping: if you want your adhesive tape to arrive in only 2 to 5 business days, go with the expedited shipping method.